The question whether the poetical passages of the Old Testament show signs of regular rhythm or meter is yet unsolved; the question involves principally Psalms, Proverbs, Job, and most of the prophetical books, with many songs and speeches contained in the historical books. The subject of strophic arrangement is not treated here, since it relates as much to the divisions of thought as to those of metrical form (see Parallelism). "O my God! by Thy name now redeem me, And by all Thine omnipotence free me." The rime is unessential, though it is perfect in the Hebrew. The important matter is the regularity of movement, indicated by the symbol 3 + 3, which means that the verse consists of two equal stichoi separated by a cesura, each stichos having three tones. The movement may be termed either "rhythmical" or "metrical," for the two are identical, as Sievers has shown ("Studien zur Hebräischen Metrik," p. 25, Leipsic, 1901). It is just as erroneous to call such a Hebrew verse a hexameter as it would be to apply that term to its English equivalent; it is convenient to call each tone-section a foot, but even that designation must be explained as referring to rhythm, not to syllabic division. That which gives these feet their metrical character is not the accent, which only marks, not makes, the rhythm; it is the flow of time, as measured in waves or pulse-beats recurring at regular intervals. The time being equal, it matters not whether the syllables in the different feet are alike in number or not. In the example given they happen to correspond; each foot has the form except that the two riming feet are of the form . This same measure (3 + 3) holds in Psalms liv., lxvii., and lxxxii., and it is a curious coincidence that verse 5 in each is extended to 3 + 3 + 3 tones, while nearly all the other verses have 3 + 3. Psalm c. begins with a single 3, has a triple 3 in verses 3 and 4, and ends, as does Psalm lxxxii., with a kind of Alexandrine. The remaining feet are 3 + 3. All these are short psalms, but several long ones are almost as strictly regular (e.g., Ps. lxxx., lxxxi., lxxxv., xci.). Others follow prevailingly the scheme 4 + 4 (e.g., Ps. xlvi., liii. ), and there are still other combinations, as 2 + 2, 3 + 2, and 4 + 3. Outside the Psalms there are many poems and long sections either completely or measurably regular, as Deut. xxxii., Ex. xv., Isa. xli. 1-10, and large portions of the Book of Job. But the great majority of the Psalms are very irregular, and some of them defy all metrical rules (e.g., Ps. xlv., lv., lxiv., lxxi., lxxxvi., xcv., cii.). The common practise is to be censured, which, by conjectural emendation, alters the text in such cases to fit the assumed meter. Conjectures that approve themselves on critical grounds give, to be sure, one more sign of their correctness when they smooth rough meters; but no metrical system thus far proposed has proved satisfactory. An example or two may serve to soften the apparent dogmatism of this judgment. One of the most elaborate metrical systems is that of Sievers (1901), who analyzes 93 poems. Of these, 20 are psalms, but not a single rhythmically difficult psalm is included. 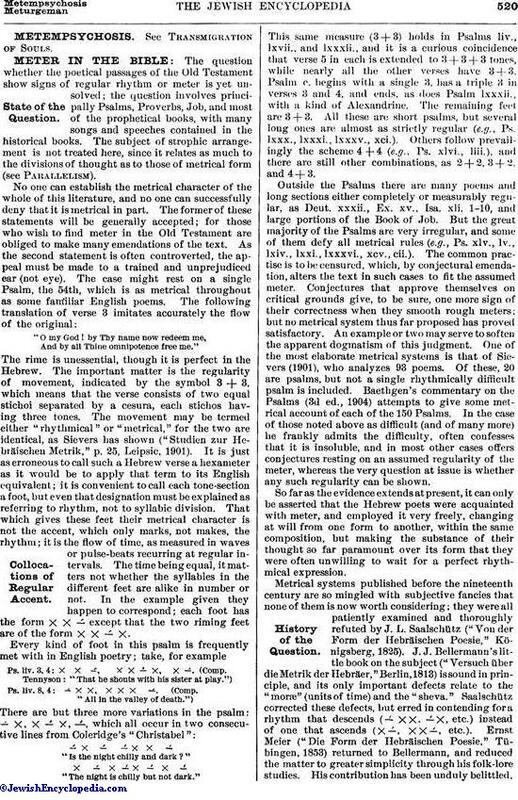 Baethgen's commentary on the Psalms (3d ed., 1904) attempts to give some metrical account of each of the 150 Psalms. In the case of those noted above as difficult (and of many more) he frankly admits the difficulty, often confesses that it is insoluble, and in most other cases offers conjectures resting on an assumed regularity of the meter, whereas the very question at issue is whether any such regularity can be shown. So far as the evidence extends at present, it can only be asserted that the Hebrew poets were acquainted with meter, and employed it very freely, changing at will from one form to another, within the same composition, but making the substance of their thought so far paramount over its form that they were often unwilling to wait for a perfect rhythmical expression. Metrical systems published before the nineteenth century are so mingled with subjective fancies that none of them is now worth considering; they were all patiently examined and thoroughly refuted by J. L. Saalschütz ("Von der Form der Hebräischen Poesie," Königsberg, 1825). J. J. Bellermann's little book on the subject ("Versuch über die Metrik der Hebräer," Berlin, 1813) is sound in principle, and its only important defects relate to the "moræ" (unit of time) and the "sheva." Saalschütz corrected these defects, but erred in contending for a rhythm that descends ( , etc.) instead of one that ascends ( , etc.). Ernst Meier ("Die Form der Hebräischen Poesie," Tübingen, 1853) returned to Bellermann, and reduced the matter to greater simplicity through his folk-lore studies. His contribution has been unduly belittled,even by Kuenen; its chief mistake was in applying to all poetry what is true only of a part. Julius Ley ("Grundzüge des Rhythmus in der Hebräischen Poesie," Halle, 1875) supplied that defect by a fundamental investigation which gave a scientific basis to the whole subject. His system was cumbersome at first (1866), but he improved it under the criticism of thirty-five years. 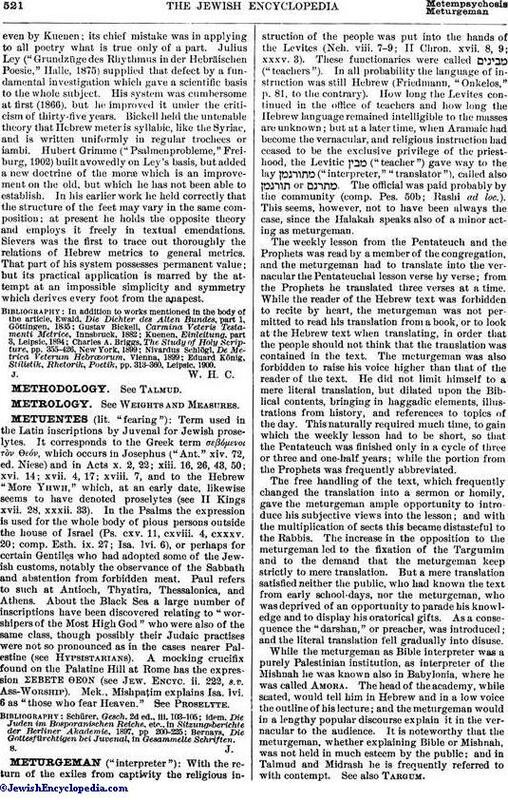 Bickell held the untenable theory that Hebrew meter is syllabic, like the Syriac, and is written uniformly in regular trochees or iambi. Hubert Grimme ("Psalmenprobleme," Freiburg, 1902) built avowedly on Ley's basis, but added a new doctrine of the moræ which is an improvement on the old, but which he has not been able to establish. In his earlier work he held correctly that the structure of the feet may vary in the same composition; at present he holds the opposite theory and employs it freely in textual emendations. Sievers was the first to trace out thoroughly the relations of Hebrew metrics to general metrics. That part of his system possesses permanent value; but its practical application is marred by the attempt at an impossible simplicity and symmetry which derives every foot from the anapest. Eduard König, Stilistik, Rhetorik, Poetik, pp. 313-360, Leipsic, 1900.